Nearly 240 square miles of Lake Okeechobee, the largest freshwater lake in Florida, are covered in a scum of blue-green algae that has also traveled down nearby waterways and out to the coastline. The stinking sludge has impacted local ecosystems and the tourism industry and caused Gov. Rick Scott to declare a state of emergency in the affected counties. 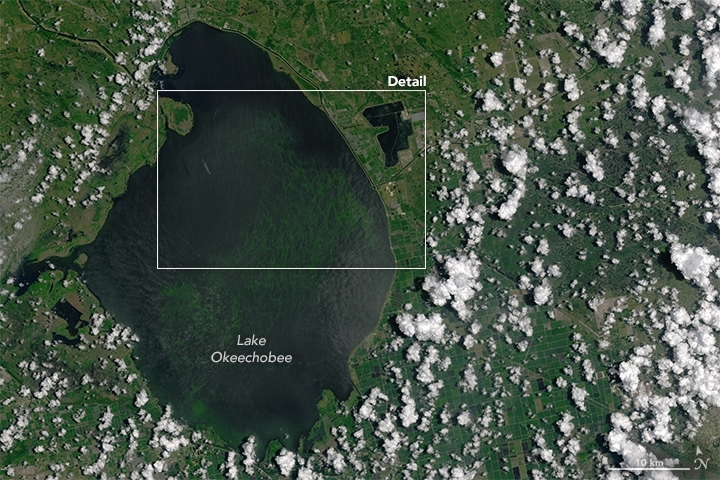 A blue-green algae bloom in Florida's Lake Okeechobee. 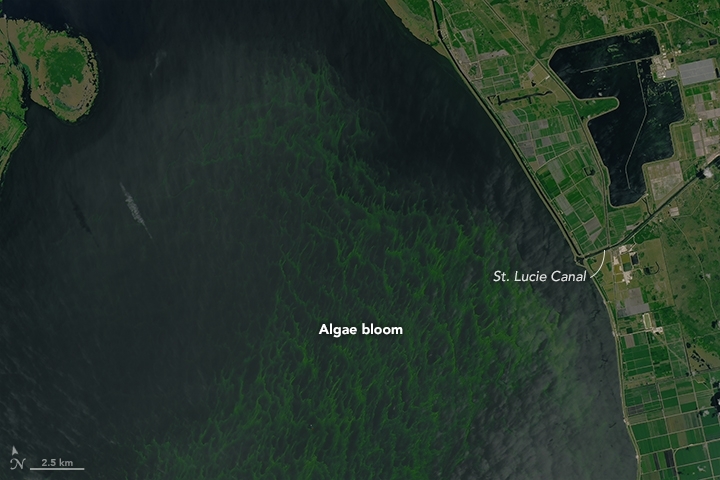 Due to releases of water, the algae spread through the St. Lucie Canal and out to the coastal waters near Stuart, Fla. The algae bloom is the result of a combination of factors, including the abundant nutrients washed in from surrounding agricultural lands, heavy winter rains and hot, calm summer weather. In the future, such blooms could become more common as Earth’s rising temperature heats up lakes and oceans, providing a more favorable home for algae and other potentially toxic microorganisms in the water. The Okeechobee bloom began in May, when it was only about 33 square miles in area. Nutrients that the algae need to flourish are plentiful in the lake, primarily coming from fertilizers used in agricultural land. But those nutrients are not enough on their own to fuel a bloom; normally the lake is too turbid, with sediment in the water blocking the light that the algae need to drive photosynthesis. But in May, calm weather led to stiller water that let light through its upper layers, allowing the algae (a type called Microcystis) to go wild. “All it takes is the right weather,” Karl Havens, director of the Florida Sea Grant, said. Havens hasn’t studied this particular bloom, but said it bore a strong resemblance to what happened during the last major such bloom in 2005. Added to that recipe were very heavy winter rains (due largely to a strong El Niño) that led to high water levels in the lake, taxing an old, ailing dike. To ease the pressure on the dike, the U.S. Army Corps of Engineers released water from the lake, which took the algae down the St. Lucie River and out to coastal waters, along with enough freshwater for them to thrive in the normally saline estuary. The algae are a major concern because of the potential harm they can do both to the local ecosystems and human health. They can release toxins that can cause respiratory problems in humans and can be deadly to local fish and other aquatic species. As they die, the algae also use up the available oxygen in the water, creating so-called dead zones. Dying algae also release a pungent odor that can mean tourists stay well away, hitting the local economy. Lakes and oceans are warming up as they absorb some of the excess heat trapped by greenhouse gases accumulating in the atmosphere. According to the most recent report of the Intergovernmental Panel on Climate Change, the oceans around Florida could warm by 1.8° to 5.4°F (1° to 3°C) by the end of the century depending on emissions levels. A 2015 study that Havens co-authored found that 70 percent of 235 freshwater lakes around the world were warming faster than the oceans. On average, they have warmed by 0.61°F (0.34°C) per decade over the last 25 years. In some cases, lakes were warming even faster than the local air temperature. Florida is a spot where lakes have been warming more slowly, though why is unclear, Havens said. Warmer water temperatures could provide a more favorable environment for algae to grow and affect where they occur, how quickly they grow and how toxic they are. The 2015 study found that such blooms should be expected to increase by 20 percent in lakes. The algae bloom had reached nearly 240 square miles by mid-July. This satellite photo was taken on July 2, 2016. Algae, of course, aren’t the only potentially harmful microorganisms lurking in the water that could benefit from warmer temperatures. “When you go to the beach, there’s always some amount of viruses, protozoa and bacteria,” Havens said, and many of them thrive in warmer temperatures. When Will the Bloom End? Havens expects the issue of increased algae blooms to be a bigger problem in the near future for Florida than sea level rise. While lowering greenhouse gas emissions to curtail warming would help the problem, an easier strategy might be to attack the problem from the nutrient side, Havens said. Research he has conducted suggests that the temperature response of algae was much stronger when nutrient levels were high than when they were low. But controlling nutrient runoff into Lake Okeechobee has been a thorny political issue. And even if all runoff from current agriculture was stopped, years of farming have left enough phosphorous that it would take 50 years to wash it all out of the surrounding sediment, Havens said. In terms of controlling the current bloom, the Army Corps has agreed to scale back discharges from the lake. But when the bloom dissipates may ultimately depend on the thing that allowed it to form in the first place: the weather. If a weather front comes through with strong winds, it could stir up the water enough that “that could be the end of it,” Havens said. But if calm, hot conditions persist, so will the algae bloom.